Bruxism, or teeth grinding, can result in serious dental damage and predispose patients to problems like cavities and tooth loss. In the long term, bruxism can also cause or contribute to symptoms of TMJ, a painful jaw joint disorder. Because bruxism often occurs when patients sleep, protective mouthpieces called night guards are frequently recommended to prevent dental damage. 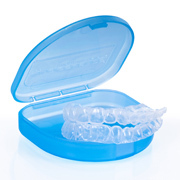 Our Los Angeles night guards expert offers customized night guards that fit properly and guard patients against bruxism damage when they sleep. Knowing the signs of bruxism and TMJ can help patients identify a possible need for a night guard. In some cases, patients with nocturnal bruxism have headaches in the morning from muscle tension. Teeth that are loose, unevenly worn, cracked or chipped may also signify the condition. TMJ can also be a sign of bruxism, with symptoms including pain in the jaw joint and ear, discomfort upon opening the mouth and popping or clicking sounds when eating or speaking. If symptoms of bruxism or TMJ are present, patients may benefit from visiting our expert in night guards in Los Angeles. Night guards serve patients in several ways. After beginning to wear one, patients often experience prevention of headaches and jaw pain. Symptoms of TMJ may subside as patients continue to wear a night guard when they sleep. In addition, patients may experience significant improvements in their quality of life and dental health. Designed to fit properly, customized night guards from our Los Angeles night guards expert may be more effective than one-size-fits-all night guards because they stay in place more reliably. All patients may suffer major dental trauma if they experience nightly bruxism, but patients who have dental restorations or cosmetic additions such as fillings, crowns or veneers are at risk of experiencing severe and expensive damage from grinding their teeth. Bruxism sufferers can visit our expert in night guards in Los Angeles to provide dental impressions for use in making the protective mouthpiece. At the next appointment, patients receive their custom night guard from our female dentist in Los Angeles with instructions on how to use it for the greatest possible protection against bruxism.